It may be because I´m thinking about new projects like learning how to crimewrite and to write in German that I´ve begun to see and smell a rat here and there. Or it may just be that I’m a natural idiot, something that transpired from last week´s wonderful workshop on Idiocy and Resistance. 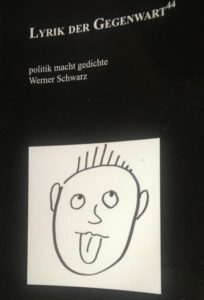 The politics in the poems of Werner Schwarz that I´ve just been reading and the online poli-workshop of Julya Rabinowich in which I recently participated have no doubt also left their marks. So the latest invitation to a talk at the US Embassy´s Amerika House jumped from my inbox onto my seething cerebral compost heap. Spool back a little, bearing in mind that there is still no US Ambassador although there was a threat of some Sound-of-Music overkill via a faithful patron of that Mar-al-Lago place. I have enjoyed the events at Amerika Haus and felt that discussions on the world according to Trump, and Black History Month were of interest to maintain a US fence-sitting position albeit (Ivanka, you watching?) with a wet finger raised to see how the wind blows in Europe. But now, we know how the wind blows, with even a slim-fit suit blown rightwards with a gaze fixed on somewhere neatly over a rainbow. A US American (a Mercer guy) – in another post I point out that America is more than just the US – who favours rewriting history will be in conversation with an academic – the imprimatur of the university does add a bit of panache it would seem – who likes to play the whole field with advice to both the 1% and the 99%, and no doubt to all the colours of the rainbow. Oh, and btw, wasn´t another of Mercer´s guys testing the waters in Vienna at Gamechangers back in April? Interestingly, the time now seems right for Trump´s Amerika to go whole hog and install his wrecking balls officially in a new not-so-true-blue Austria. 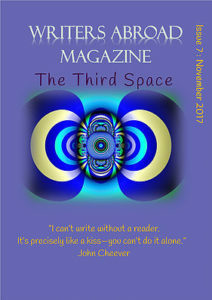 But for my own wellbeing I do need to end on a high note and so am pleased to share that my flash, “The End of an Affair”, appears in Writers Abroad Magazine´s November Issue – I´m delighted to be the inaugural guest writer, and may there be many more. 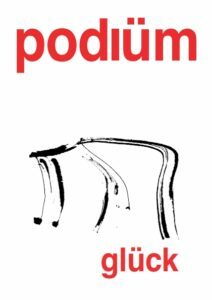 Another delight is that several of my pieces appear in English in the latest issue of the German-language litmag, PODIUM; the issue on Glück – happiness, luck, even love, I ask (whatever it is, we all need it) – was curated by Judith Nika Pfeifer who, together with Jörg Lukas Matthaei also ran the Vienna Poetry School´s Idiocy and Resistance workshop. So until next, with a smile on my face, but true to my gut, I bid you onwards! Posted in: Blog. 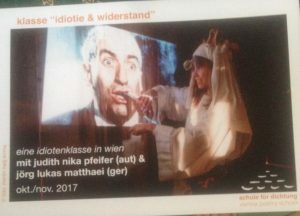 Tags: Amerika Haus, Idiocy & resistance, Jörg Lukas Matthew, Judith Nika Pfeifer, Julya Rabinowich, Literaturhaus, Mercer, Schule für Dichtung, Trump, Vienna Poetry School, Werner Schwarz. Mate, I am so proud of you.